Hi Everybody...I am moving in 2 weeks and taking my own advice by not just packing up and taking everything with me. I have some Clay things that I am giving away. All you need to do is say that you want it and it's yours. I will add the items to this first post as I come across them. I'm sure most fans have this stuff but maybe there is a thing or two missing from your collection. Keep your eyes peeled here. Damn, sorry about the quadruple post. Here is what I have so far. Anything not taken by January 3rd will get donated to NIP through From Claygary. OK here is the first batch of stuff. That is super nice of you! You have posted this many duplicate times by accident. Will wait to see your list. 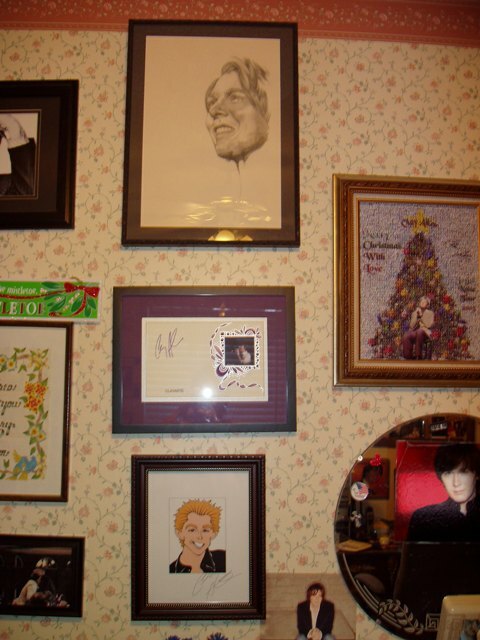 I still have an entire Clay Room and would love to give your Clay memorabilia a good home. I am never giving up my room unless I pass away. My husband has instructions to donate everything I have to the National Inclusion Project at that time. Hopefully not too soon though. I would be happy to give you my email address and send pics of my collection so you can see that I am serious. I attached one here too. I still check Ebay for items to buy and there is a small group of girls I still email that trade pins with me. Please consider me for you offer. I forgot to mention in my reply that I will pay for shipping. Looking forward to the list as well, would love to have some things for the NIP. Interests:Scrapbooking, polymer clay, volunteering with the elderly, helping less fortunate people. Looking forward to see what you have! couchie just posted her list in the first post of this thread. Have fun everyone! Hi, couch tomatoe---I'm still Clayverting folks lol I can use more of Clay's cds to give away. I don't have all of them anymore...If you can spare the MOAM cds & ATDW cd It would be appreciated and put to good use. I still love this man and always will. I'm sooo saddd that there won't be more cds or tours. We had so many great times together! Hi, Rochelle33.... long time, no see. I'd take the AIW EP for sure, and the Christmas ornament. I'll pay shipping of course. I would like the Christmas post card if it is still available. I will pay mailing costs. couchie, you have a lot of nice Clay stuff to find homes for. I would be interested in the hardback, Learning to Sing - I have the paperback version, but the pages are falling out, so I'd really like to upgrade. However, if someone who doesn't have the book at all would like to have it, they should have priority. For some reason, I'm thinking we both live in the bay area(SJ? ), so, if so, I can come by and pick it up. Interests:Buying these pins for my wife and her twin sister! wHATAVOICE..i'm in San Lenadro. Are you ever in this area? Plan to post the rest of my things on Thursday morning. If I can the Independent Tour Book, Not a Tour Book 2004, and People X-tra about Season 2. Whatever postage is let me know and i will send you a check. Luckiest - so true. I know I'm giving a lot of stuff away but I am keeping some very special things. The magazines they are just sitting in a box. gathering dust. I'd rather give them to someone who will at least look at it from time to time LOL.